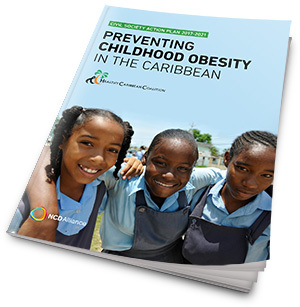 The Healthy Caribbean Coalition’s (HCC’s) Civil Society Action Plan 2017-2021: Preventing Childhood Obesity in the Caribbean was developed to guide the response of Caribbean civil society to global, regional, and national recognition of the increasingly heavy burden of noncommunicable diseases (NCDs) and upward trends in the prevalence of overweight and obesity among children. 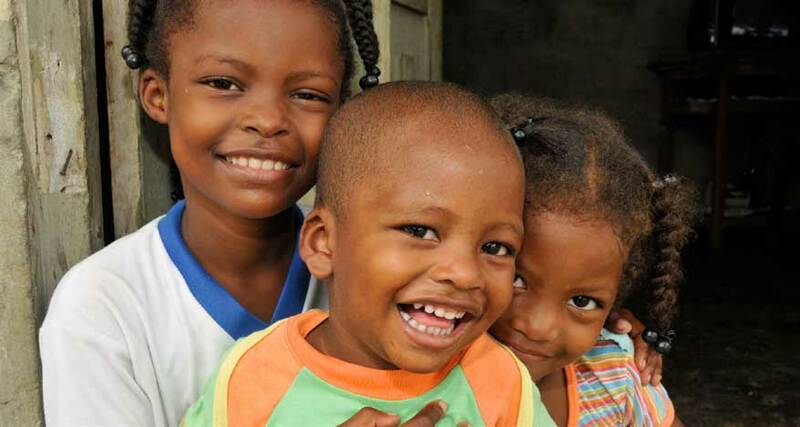 One in every three children in the Caribbean is overweight or obese and this figure is growing. 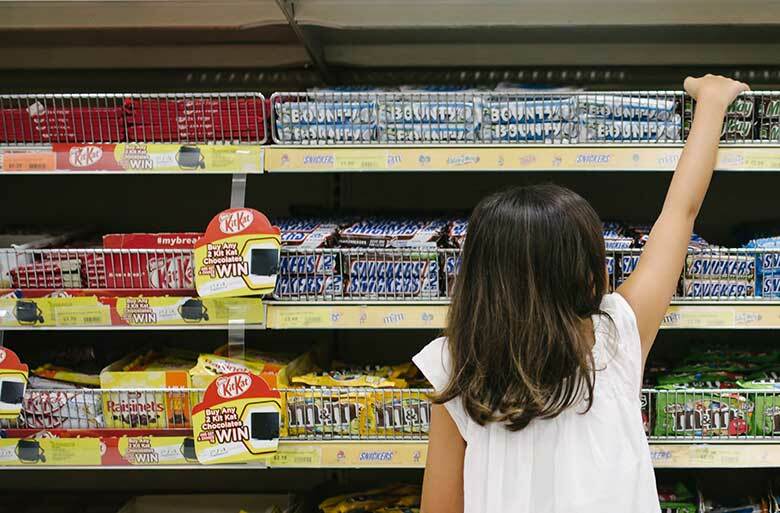 Childhood obesity is the canary in the coal mine – forewarning a health crisis affecting entire generations and frustrating the development of our already vulnerable states. This is a social justice issue which requires decisive structural change which protects the basic right to health owed to our children. Civil society has a pivotal role to play in calling for a supportive policy and legislative environment. 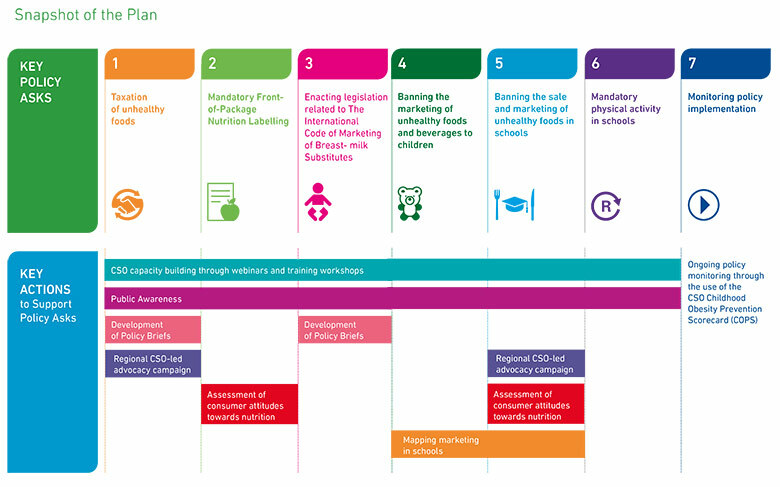 The goal of the plan is to halt, by 2025, increases in childhood obesity in the Caribbean and the PURPOSE is to contribute to the development and implementation of relevant policies, legislation, and regulations by countries of the Caribbean Community (CARICOM). 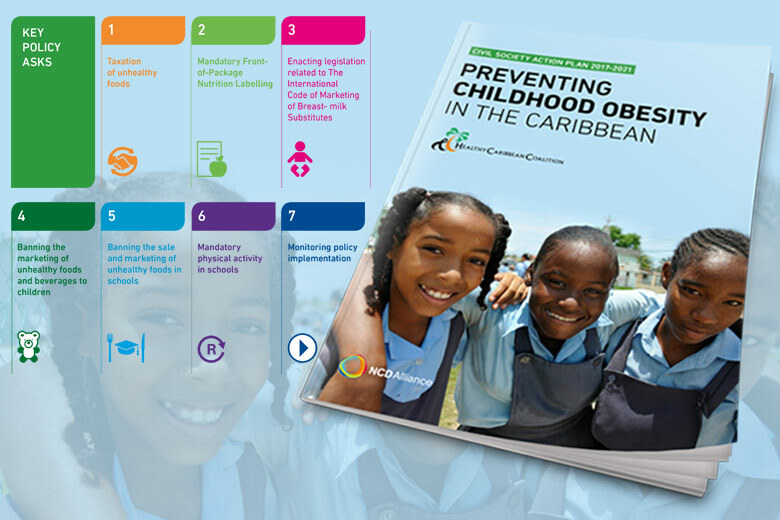 Through this plan, the HCC and our national heath- and non-health civil society member organisations, commit to working collaboratively with governments, and regional and international partners to play our role in being engines for change in the Caribbean, driving all efforts towards our collective goal of halting the rise of obesity among children. 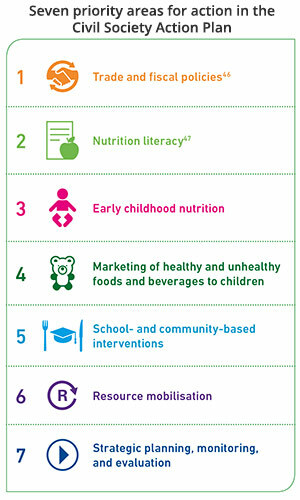 Childhood obesity predisposes to the development of NCDs early in life and is a marker for adult obesity, which itself predisposes to NCD development. The rates of childhood overweight and obesity in the Caribbean are staggering and among the highest in the world. Left unchecked, they threaten to undermine the health of entire generations and reverse development gains across the region. Civil society, collaborating with government and the private sector, has a critical role to play in taking action to address this condition, and the HCC, as the sole Caribbean regional civil society organisation (CSO) working in NCD prevention and control, recognised the urgent need to develop a framework to support and coordinate civil society’s actions in this arena. The Action Plan will guide the HCC secretariat and members in performing functions related to advocacy; health education and promotion; community engagement and mobilisation; holding governments, the private sector, and civil society itself accountable for their commitments; contributing to policy and programme development, implementation, monitoring, and evaluation (M&E); networking, promoting partnerships, and contributing to multisectoral action; and resource mobilisation, in order to contribute to childhood obesity prevention. This plan was developed with the support of the NCD Alliance as part of the Expanding Access to Care, Supporting Global, Regional and Country Level NCD Action Programme in partnership with Medtronic Philanthropy. Read/Download the Action Plan here.